Deciding to buy your first home can be both an exciting and overwhelming time and you may not know where to start. Here is a short list of things you can do to help you get started on the journey to your first home. When you decide you’re ready to become a homeowner, the first thing you should do is start saving for a down payment. While there are some no or low down payment options, most conventional mortgages require 20% down. If you aren’t able to reach this, you may still qualify for a mortgage, but will have to pay private mortgage insurance. The more you are able to put down, the less your monthly payment will be. It’s important to buy a home that you can afford. Once calculating what you could potentially qualify for, plan your budget as if you are already in the home. Every paycheck, subtract the amount of your “mortgage” and put it into a separate savings account. If you feel like you’re drowning after a few months, then you know you’ll need to find a lower priced home. A mortgage should never exceed 30% of your salary. Make a list of your wants and needs for your first home. Needs include items such as number of bedrooms or bathrooms, being located near your job, or a one story home. Wants include items such as hardwood floors, an updated kitchen, or a swimming pool. Just remember, your budget needs to play a big role here. You may have to prioritize your needs over your wants for your first home. Once you start looking at homes, stay open minded as you may be able to find a home within your budget that has the potential to become your dream home. Before you start looking for a home, you need to find a real estate agent. Don’t just pick the first person you find, schedule interviews and find a person who you will work well with. If you aren’t quite sure what you should be asking, there are several examples online. 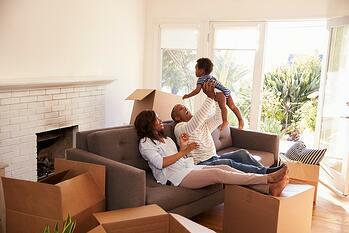 Ask friends and family who have moved recently for recommendations if you aren’t sure where to start. Once you select an agent, share your list with them so they can find homes that fit those parameters. Once you get everything in order and are ready to start house hunting, it’s time to get pre-approved. This is not the same as being pre-qualified. With pre-qualification, a quick look will be taken at your finances to see what you could possibly afford. With pre-approval, you will fill out a loan application and receive a conditional agreement on the amount of the loan. If you need a little extra help, our home loan advisors are a great resource. They are more than happy to meet with you and answer any questions that you may have regarding the home buying process. If you would like to schedule a no obligation consultation with one of our advisors, you can call (801) 260-7600 ext.5340 or email mortgages@cypruscu.com.